President Obama's final State of the Union address is set to take place on Tuesday night, and the speech is expected to highlight his recent executive actions on gun control in addition to the many goals Obama has achieved during the course of his two terms as president. Given the fanfare and the historically lengthy amount of clapping, many are wondering just how long will the State of the Union be? Data from The American Presidency Project suggests that Obama's final remarks to the country will last around an hour and four minutes given the length of his last six State of the Union addresses. 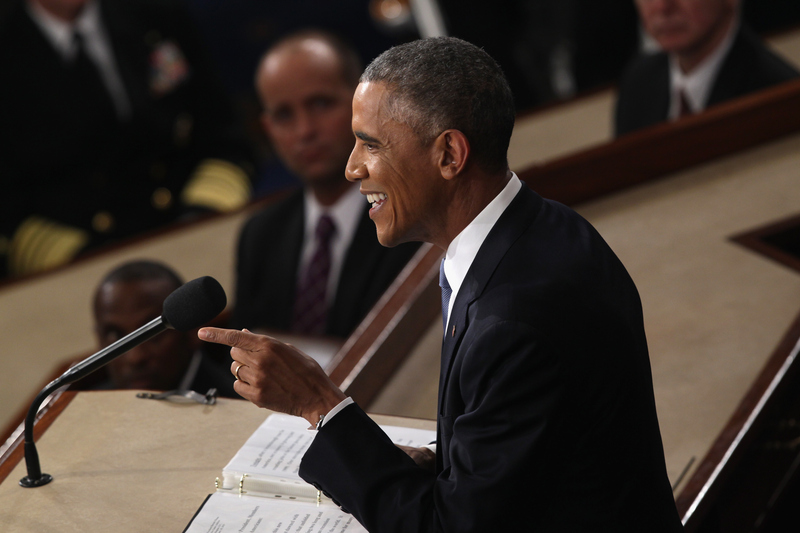 2010's remarks marked Obama's longest State of the Union speech at an hour and nine minutes, while 2013 was the shortest at 59 minutes. The length of Obama's remarks tend to fluctuate very little and most networks have set aside at least an hour, according to TV Guide listings. Fox is offering the bare minimum hour before it broadcasts local programming, while CNN's coverage spans a full two hours and includes the Republican response immediately following the State of the Union. Looking over the past nine presidents from Lyndon B. Johnson to our current commander in chief, it appears that Obama is the second most verbose of his contemporaries. Bill Clinton was the most long-winded of the nine presidents while Richard Nixon consistently offered the most concise remarks. At his most talkative, Clinton's 2000 State of the Union speech was over three times as long as Nixon's shortest speech, which was a 28-minute oration delivered in 1972. It appears that the average length of State of the Union addresses have fluctuated but continue to consistently rise. Perhaps it's the dizzying amount of clapping that has pushed them in a longer direction. The 2015 State of the Union included an overall amount of 13 minutes and 41 seconds of applause. Those either too impatient to sit through what the president has to say or who can't get to a computer or television on Tuesday night can always view a copy of this year's SOTU speech transcript via the White House website. One of the stranger traditions of the State of the Union is its advance release, primarily intended for the vice president and speaker of the house. As the two look on, seated behind Obama during the evening event, they will have received a physical copy of the SOTU speech in an envelope — their final from president Obama as he begins his last year in office. Next year's SOTU will feature a whole other POTUS. Given the many eloquent orators dotting the 2016 election field, it's safe to say that the 2017 State of the Union may be even longer.